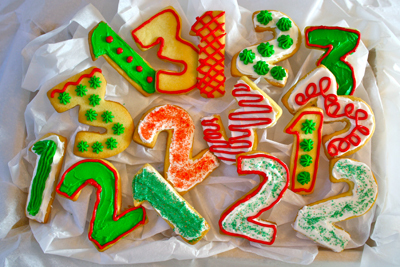 Don’t you love to see beautifully decorated cookies during the holiday season? Well, these may not be the most beautiful, but they sure are delicious! I am working on a wonderful campaign from Smart & Final and The California Milk Advisory Board called “Help Our Teachers, Help Our Kids.” Students and families collect Real California Milk seals from select Smart & Final First Street products, then their teachers submit the seals. Each seal counts as one sweepstakes entry. 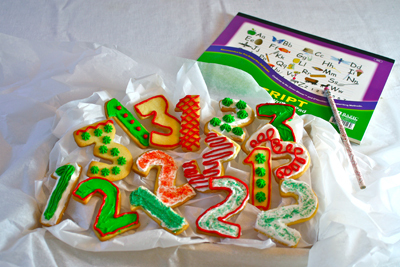 Teachers who submit 100 seals get 25 Scholastic books or a $25 school supply gift card. Each teacher who enters gets one Scholastic book. The First Street products in this campaign are all items you probably buy each week, such as butter, milk, cottage cheese and ice cream. To support this campaign, please visit the First Street Supports Southern California Schools website. My last post for the campaign was Creamed Corn with Maple-Pepper Bacon. This post I needed to come up with a gift idea for teachers. My Master Cookie Dough uses First Street butter, and is easily made into lovely Christmas cookies to give to your favorite teachers. I enlisted my four year old to help me decorate the cookies, which of course meant lots of icing licking and sugar eating while completing her task! 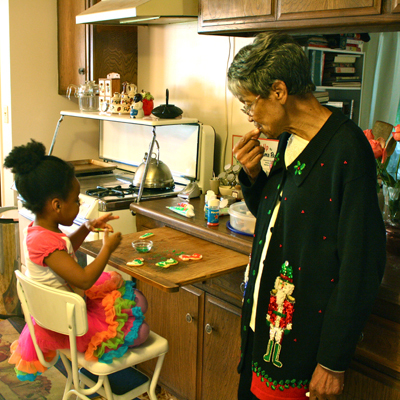 Grandma got in on the action, eating the cookies with her Granddaughter. Don’t you love the Nutcracker sweater my mother brings out every Christmas? Oh boy. . .
Heat your oven to 350 degrees. Remove the dough from the refrigerator and let sit at room temperature for 10 minutes. Roll out the dough to 1/8 inch thickness on a lightly floured surface. 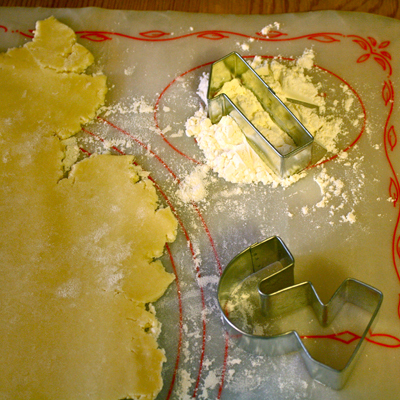 Dip the cookie cutters in flour to ensure the cookies do not stick. 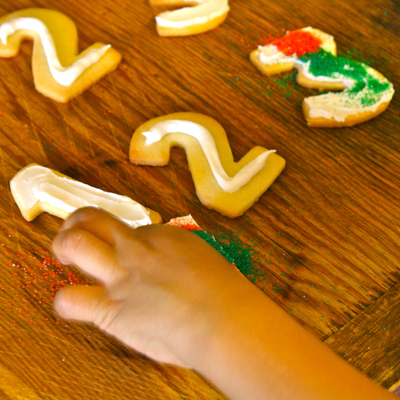 Cut out the cookies and place them onto a baking sheet. Re-roll the dough scraps to make more cookies. 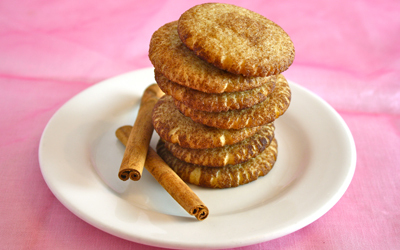 Bake the cookies for 10-12 minutes, until crispy and golden brown. 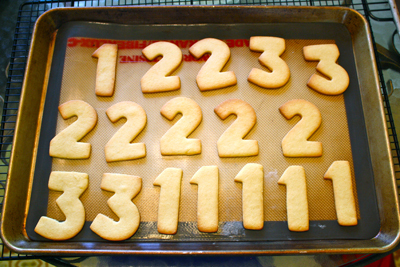 Let the cookies cool completely before decorating them. Although I called for tubes of icing, you can make your own in whatever colors you choose. If you really want to be fancy, you can make royal icing, a thin and smooth icing. Have fun, let the kids have fun and make a teacher smile! This project has been compensated as part of a social shopper insights study for #collectivebias #CBias I received a gift card from Smart & Final to buy all groceries. How adorable is your daughter?! So precious. 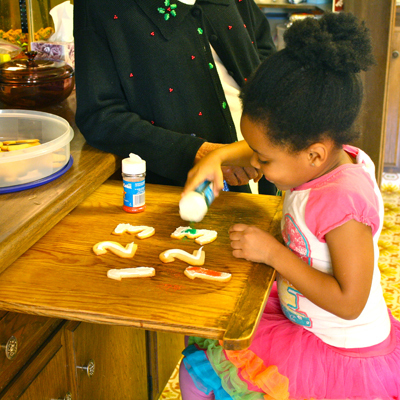 Making Christmas cookies is one of our family’s annual traditions, and we have so much fun.